Franz Marc / August Mac. The Adventure of the "Blue Rider"
Franz Marc (born February 8, 1880, Munich, Germany —died March 4, 1916, near Verdun, France) is a German artist, one of the great exponents of Expressionism. 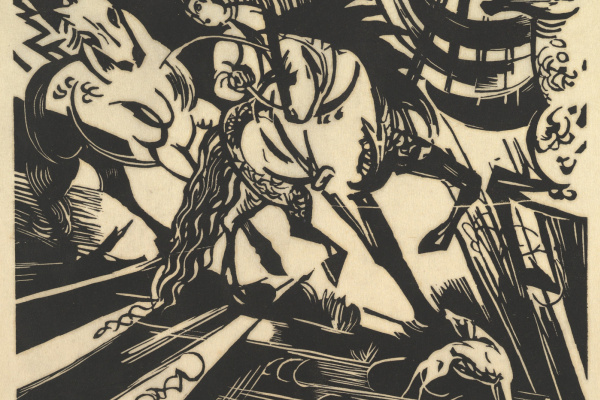 Along with Wassily Kandinsky, he founded The Blue Rider Group (Der Blaue Reiter), an association of German Expressionist artists and an almanac. • The artist has been painting animals all his life. He believed they were supreme beings and tried to find their special feelings about themselves within nature that have been lost by the modern humans. • Marc has not been watching animals from a distance but he has seen the world through their eyes. 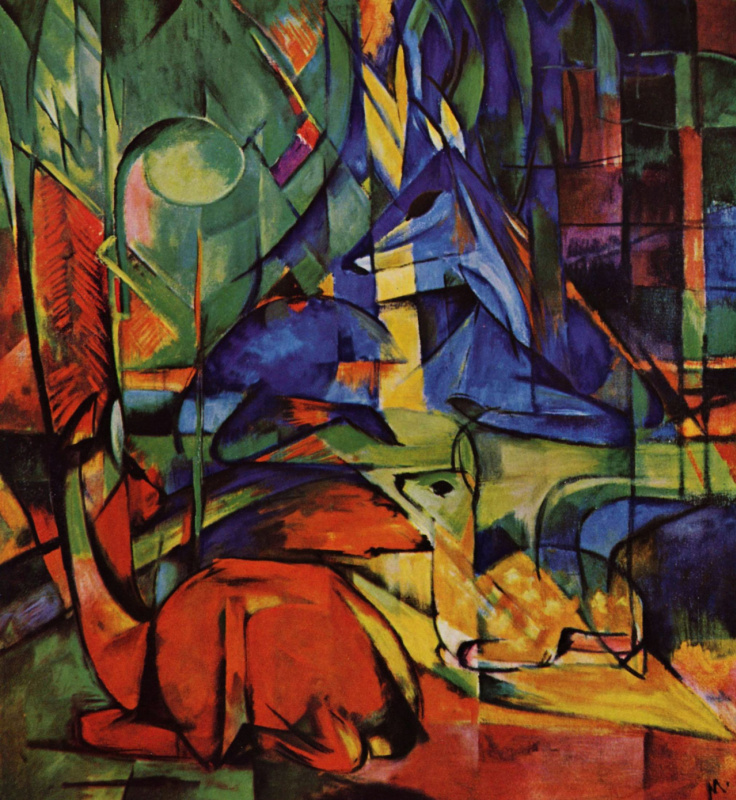 • As a painter, Franz Marc typically used sharp transitions between colors. His palette is bright and clear. His late works are filled with tense, sharp, often cubic forms. 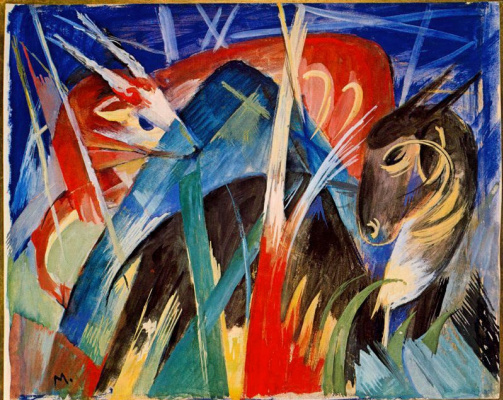 Famous artworks by Franz Marc: Fate of the Animals, The Tower of Blue Horses, Foxes, Tyrol, Deer in the Woods II. Franz Moritz Wilhelm Marc has always been a dreamer who loved horses and talked to his dog. As a child, he dreamed of being a priest in a village, as a young fellow, he dreamed of a marriage out of pity, as a mature man at the end of his short life, he thought of cleansing the world in the war. Neither one of his dreams has come true. 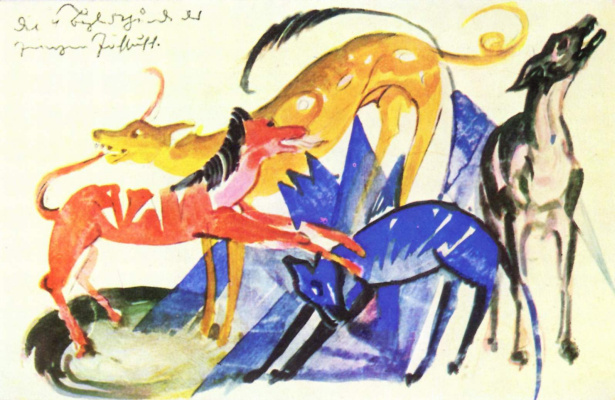 The fate that was waiting for Franz Marc did give a damn about these crackpot ideas. Little Franz was a clever, placid, and thoughtful child. He got carried away by Nietzsche back in high school. Well, it is difficult to imagine a madcap born into a family of a father artist, professing at the Munich Art Academy and specialized in animal and genre scenes, and a mother Alsacian form a strict Calvinist tradition. His elder brother Paul has become a Byzantine expert, and Franz Marc has chosen theology and philosophy at the University of Munich without a second thought. Everything was pretty serious in this family. We would never know what has happened to Franz Marc during his regular service nor could we guess the impressions he got in the armed forces. The facts tell us that he returned, having firmly resolved to give up philosophy and pursue the arts. An extensive search for his own artistic style has taken him over a decade. He entered the Munich Art Academy but was disappointed in the traditional academic education. He took a trip to Paris to copy paintings of Old Masters but was astonished by art works by Vincent van Gogh and Gauguin. He even got involved in Modern Art and Romanticism for a little while. By the time Franz Marc met with Wassily Kandinsky in 1911, he has figured out everything about himself. Brehm’s ‘Life of Animals' was his handbook, zoo was his favorite place to practice drawing, and exhibits from zoological museum composed the main source for studying the nature. Each color on his palette has gotten its own character and meaning. "I am trying to intensify my feeling for the organic rhythm of all things, to achieve pantheistic empathy with the throbbing and flowing of nature’s bloodstream in trees, in animals, in the air […]. I see no means better suited for the 'animalisation' of art than the image of an animal." 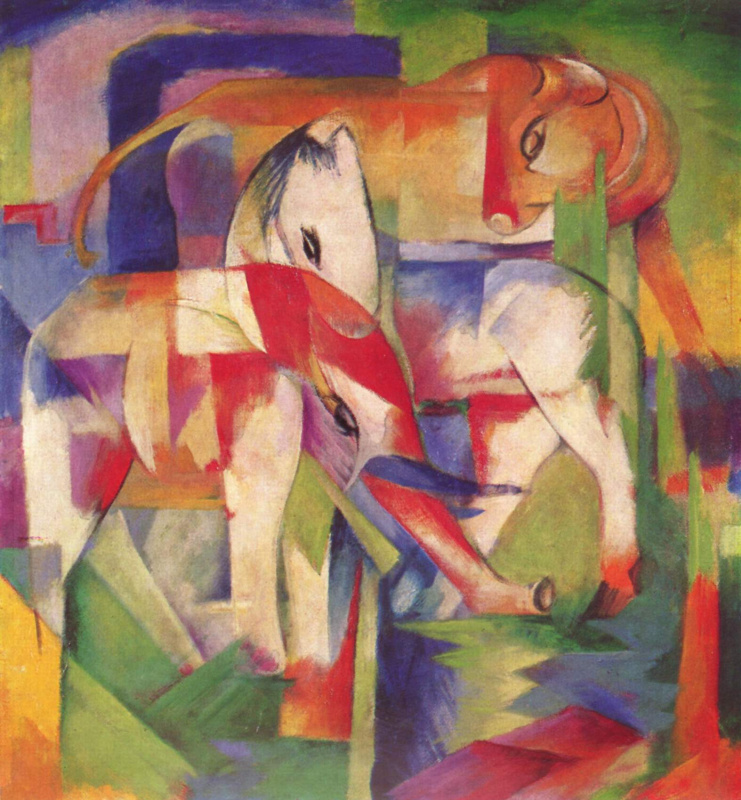 No matter how many horses, deer, or dogs has Franz Marc painted. The point is that any advanced professional in art history wouldn’t have called him 'an animalist' because depicting animals was a new dream of the painter, it was his attempt to see the world through eyes of an animal. Franz Marc and Wassily Kandinsky were preparing the first volume of The Blue Rider (Der Blaue Reiter) Almanac. They came up with the title accidentally over coffee. 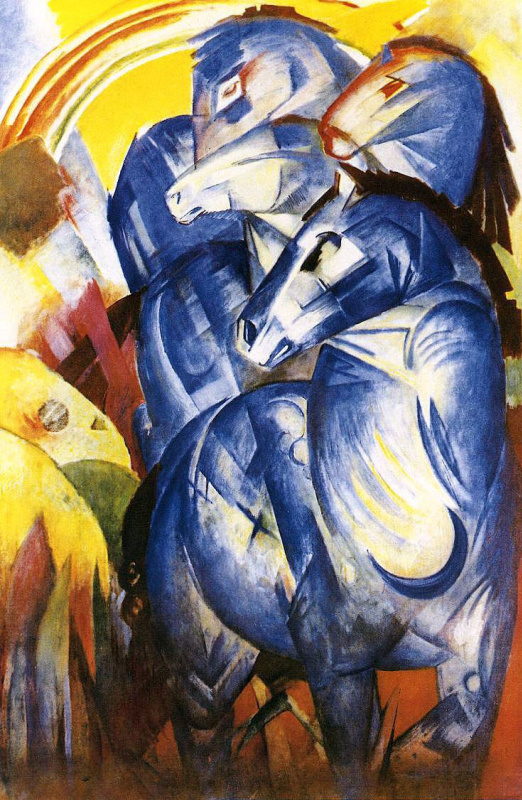 As Kandinsky recalled later, "We both loved blue, Marc —horses; I —riders. So the name invented itself." They have been selecting and editing articles and even decided to create a "synthetic book", first in the world. The artists gathered handwritten musical scores, children’s art, traditional arts and crafts, avant-garde paintings and sculptures, essays in philosophy and art theory. All of them composed a single book, destroying the boundaries between the arts. The organization of artists gathered around Franz Marc and Wassily Kandinsky was later named after the almanac The Blue Rider Group (Der Blaue Reiter). World War I broke out in a couple of years, and the first volume of the almanac has remained the one and only. 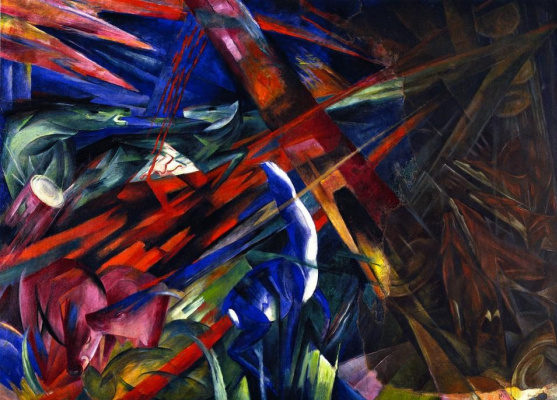 According to Kandinsky, The Blue Rider was the two of them, "Franz Marc and I. My friend died, and I alone would not want to do anything", said Kandinsky in response to a proposal to produce an almanac in the post-war years. Few knew Franz Marc closer than Wassily Kandinsky. "He looked like a highlander, a very tall man with the broad shoulders, thin face, and black hair, having a long stride. He seemed so massive and inappropriate for a city that he better fit in nature, among the mountains, in the meadows and forests. He was ‘at home' there. Usually he took long walks accompanied by his beloved big white Siberian sheepdog Russi. It looked like its owner, messy in appearance, strong and somewhat triangular in contours… They complement and understand each other in amazing way. The Black one told something to the White one in a tender voice and the White one nodded him in response." He always got on better with animals than with people. Franz Marc’s private life has always been confusing and exhausting. He felt uncomfortable in his relationships, as if he felt cramped in overcrowded cities. Neither his stormy love affair with Annette Von Eckardt, a married artist and a copyist, nor his enigmatic marriage with Marie Schniir out of charity, have brought any happiness to Franz, never had he been ‘at home' with them. The other Maria, Maria Franck, was not a bohemian beauty, the refined elegance was never her strong suit. A snub nose and a round face made her similar to a peasant girl. However, she had such an ease, an openness, and sincerity that she has become his shelter, his home, and his happiness. The lovers had to wait for four years to dissolve the first marriage of Franz Marc to enter into a second marriage and never be apart. Franz Marc was not the only young, sincere German fellow who has enthusiastically enlisted in the German Army during World War I, pursuing the world’s idea of global renewal and purge of Europe. These thoughts have saturated the air at that time. 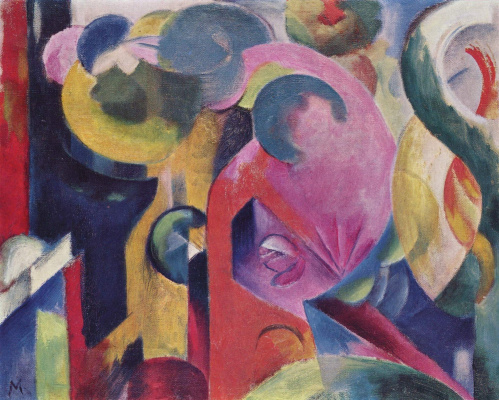 But unlike others, Franz Marc also could formulate them in well-formed texts: "I dream of a new Europe, I … see in this war the healing, if also gruesome, path to our goals; it will purify Europe, and make it ready… Europe is doing the same things to her body France did to hers during the Revolution…" "It is a war against the inner, invisible enemy of the European spirit." "Germanity will spill across every border after this war. If we want to stay healthy and strong and retain the fruits of our victory, we need… a life-force which penetrates all, without fear… of the unknown… which will bring us to our position of power in Europe." Besides his other talents, Franz Marc could state important thoughts belonging to the whole generation in a clear and succinct manner when writing personal letters. That is why his life is interesting not only to specialists in art but to historians as well, particularly to those who research this worldwide carnage. The closest friends of Franz Marc have not supported his enthusiastic expectations. 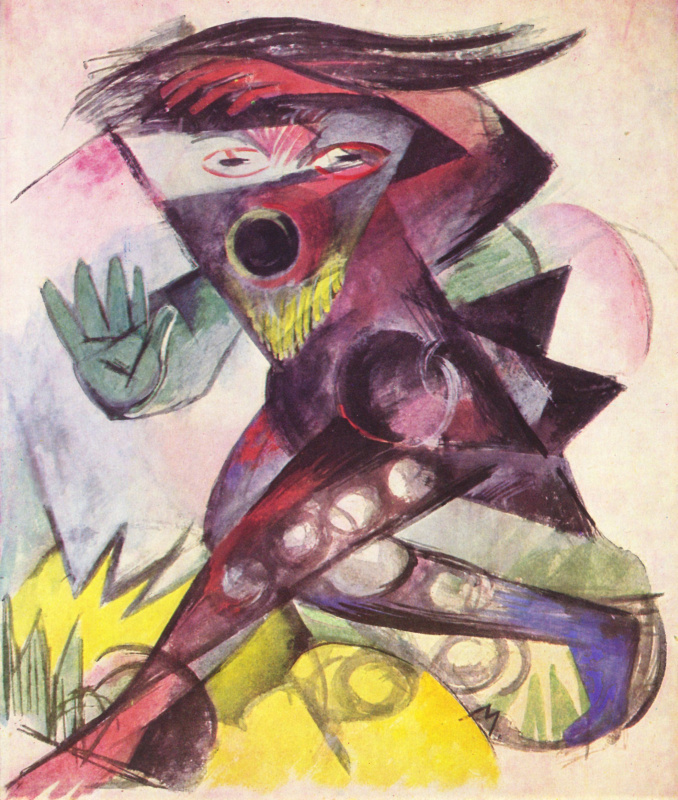 The Swiss artist Paul Klee despised even Marc’s military suit. Kandinsky was forced to leave for Russia and he has never accepted the price Europe should pay for the purge. 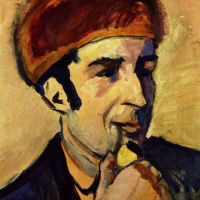 Franz Marc’s close friend and fellow artist, August Macke died very early in the war, and his death converted any arguments supporting war into nonsense. 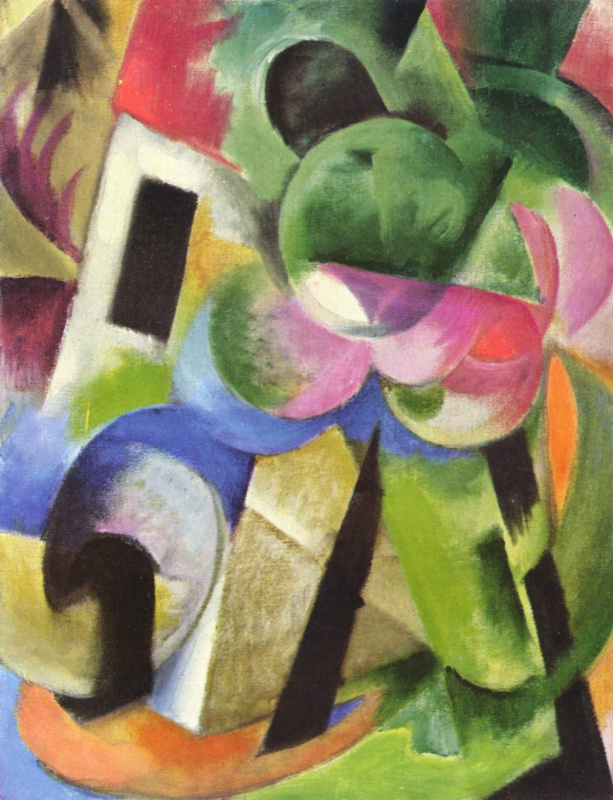 Two months after the death of the friend, Franz Marc wrote that "the most important lesson and irony of the Great War is certainly this: precisely the great triumph of our ‘technical warfare' has forced us back into the most primitive age of the cavemen." As time went on, his attitude towards the war altered completely. Franz Marc finally woke up. In 1915, he described the war as the "cruelest catch of men to which we have abandoned ourselves". To his wife Maria, the painter was even more specific: "The world is richer by the bloodiest year of its many-thousand-year history. It is terrible to think of; and all for nothing, for a misunderstanding… And that is Europe!" In 1916, the German Government prepared a list of the notable artists for the country to be withdrawn from combat. Franz Marc was on the list, but he never knew that. As if in a classical movie, where the fact of the death itself is not enough to make a spectacular passing of a hero, Marc has died several days before the order was delivered to the front. He was hit by shell fire during a reconnaissance expedition near Verdun, in one of the bloodiest battles of World War I. Both sides lost almost one million people in it. But even death of Franz Marc, the great artist and a dreamer, has not brought an awaited purge to Europe. The art was the only hope left, of which Franz Marc told so: "Art is nothing but the expression of our dream; the more we surrender to it the closer we get to the inner truth of things, our dream-life, the true life that scorns questions and does not see them." An exhibition has been added Franz Marc / August Mac. The Adventure of the "Blue Rider"
Caliban, costume design for Shakespeare's play "the Tempest"